In an earlier blog (here) I wrote about the essentials of a great facial, putting it simply: 'You could be in a tent in a field or indeed a very posh bedouin tent in the Middle East (where great facials can also be experienced!) and under the hands of an experienced therapist and their chosen products, plump, fresh glowing skin will be yours. And the beauty of this type of facial is that this fresh, plump skin doesn't just disappear overnight - it lasts.' Under the hands of Tara O Rourke in her cosseting suite at SaolBeo on Dublin's Fitzwilliam Square, these words certainly hold true. I know Tara as a knowledgeable and highly experienced yoga teacher (teaching at Dublin's YogaRoom also corporate classes and private). She is also a homeopath, meditation teacher and advocate of all things natural and biodynamic (including wine as we both shared our common love of Chateau Feely in particular!). In essence, she is an utter professional, confident in everything she puts her healing hands to and for me that speaks volumes. At SaoBao Tara brings this collective offering to her clients and you can sense it as soon as you arrive in her her clean, fresh cosseting room with her gentle soothing manner leaving me instantly at ease. I switched off (which I don't often do) and knew I was in the hands of an expert. 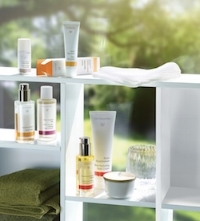 Tara has been working with Dr Hauschka for many years. 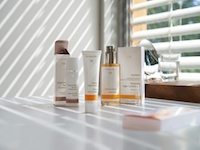 The brand has been around since the 1960s and remains one of the most recognisable names in natural skincare. It's clean, natural, free from added nasties and felt great on my skin - especially when delivered with expert strokes gliding over the face. I'm not normally a fan of precious time spent having my feet soaked before my hands-on facial (which is what I am paying for) but under Tara's watch that warm sage foot bath felt surprisingly good and was the perfect prelude to my facial. On to my skin, which thankfully is looking and feeling quite good for my middle years (even if I say so myself) I suppose with my depth of knowledge and my new GLOW book - it would want to be! This said, it was feeling quite dirty and grimy and in need of a deep clean and refresh. The facial included a blissful combination of cleansing milks (2 cleanses I think) masks, fragrant compresses and one of the most revitalising lymphatic drainage techniques I have experienced. Every step of the facial was delivered with the gentlest touch in a rhythmic, hypnotic motion - attention to every detail guaranteed. "The tiny lymph capillaries remove metabolic waste products, toxins, pathogens and superfluous tissue fluid. If the flow of the lymph is hampered, fluid can build up locally," says Tara, outlining the importance of this stage of the treatment. Lymphatic stimulation cleanses, drains and stimulates the flow of lymph. Alternating between a gentle touch of the hands and two soft brushes, the flow of fluid through the connective tissue was enhanced with calm, rhythmical movements. Room for improvement: Tara is one of those rare and immensely passionate experts in natural health (both skincare and holistic bodycare) who is happy to impart her knowledge in a gentle hands-on way. While, I like Dr Hauschka I would also like to have the choice of using another natural brand should I wish. There are so many genuinely natural, ethical brands coming to the fore (more to come on these very soon as I have been exploring) with more choice than ever before. Will I return: A resounding YES! We all need that time for ourselves and our skin will thank us. Where: SaolBeo Holistic Therapies, 43 Fitzwilliam Square, Dublin.